The great thing about the digital format is its capacity for clarity. While most movies (and for that matter, moviemakers) are fairly straightforward in their meaning and motive, sometimes, both can be confusing...or in the worst cast scenario, indecipherable. DVD allows for explanation and re-examination. It provides an outlet for the creative element to plead their case and dissect their designs. Some choose not to engage in such an indirect dialogue. David Lynch's dark, dense dreamscapes are typically viewed "as is", the auteur steadfastly refusing to provide commentary or context. On the other hand is someone like director Todd Haynes. Responsible for such compelling fare as Superstar: The Karen Carpenter Story, Safe, and Far from Heaven, he enjoys the behind the scene glimpses an aluminum disc provides. For many, his recent revisionist bio-pic of Bob Dylan, I'm Not There, was perhaps too insular to matter. Thanks to DVD, the movie now becomes a masterpiece - not that there was ever any doubt, really. 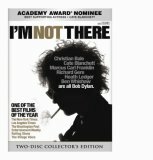 While his name is never mentioned during the entire two hour plus running time, Bob Dylan's eclectic and influential career is charted in I'm Not There. Breaking down the man's personality into his roots (African American adolescent Marcus Carl Franklin), his workingman blues (a fierce Christian Bale), his poetic side (Ben Whishaw), his superstar sizzle (the magnificent Cate Blanchett), his personal struggles (Heath Ledger), his conversion to Christianity (Bale again) and his old age iconography (Richard Gere), we get biography as burlesque, the truth tempered by the surrounding myths, folklore, rumors and innuendos that tend to make up this legend's quantifiable quality. All the iconic moments - his Greenwich Village days, his bedside vigil for Woody Guthrie, his political importance, his decision to drop folk and "go electric" - are here. We even get untold moments from Dylan's personal diary along with insights gained when Haynes sought (and was granted) permission to take on the talent. While some balked at its pretension, this critic absolutely loved I'm Not There when it was released in theaters last year - and for good reason. Todd Haynes took on the most difficult of subjects (the life and shapeshifting times of songwriter extraordinaire Bob Dylan) and found a way to be both factual and fanciful. Reimagining the artistic chameleon as one of six distinct personas, and hiring an equal number of actors to play them, Haynes helped put into perspective an important, influential artist whose vocation seemed stuck in a constant state of flux. While the conceit was obvious, the delivery was dense and filled with sometimes indecipherable exigencies. Now, thanks to DVD, everything is clear as crystal. On a commentary track that should be mandatory listening for any would-be bonus feature participant, the director goes into excruciating detail, explaining almost every facet of his fascinating film. He provides historical context, examples from his subject's real life, and enough aesthetic allusions to make even the most complicated ideas appear creatively cogent. It's as if the filmmaker is sitting right next to you, notebook in hand, ready to provide footnotes and answer all your questions. Even without such assistance, the movie resonates on its own unique level. I'm Not There is like a puzzle played out on a pop culture scale, a salute to someone who very few outside his sphere of influence ever really got to know. How a young Minnesota boy became a folk rock legend, only to reinvent himself as a protest singer, a pop songsmith, a Fab Four mentor, and a big country gentleman (among many others) fuels this amazing tour de force, the kind of insightful experiment that hits all the right notes while it avoids the obvious elements the tell-all variety mandates. Using nods to films and filmmakers - 8&1/2, Richard Lester, Masculin Feminin, D.A. Pennebaker - of the specific era, Haynes wraps everything up in a visual grace that is astounding, and then populates it with performances that actually boggle the mind. Every actor here deserved Oscar consideration. While Blanchett got the bulk of the attention (and the Academy nod), two other names are definitely worth mentioning. While he's known for his bigger, broader roles, Christian Bale is a brilliant folk era Dylan. He's got all the blasé swagger and poli-sci pin-up looks down pat. Similarly, the late great Heath Ledger is given the charge of turning the messenger into a mere man. He manages superbly. Yet it's the DVD experience that puts things over the top. Those without an inkling of interest in what Dylan did during the '50s, '60s, and '70s will still get a kick out of hearing Haynes explain his approach. He's got it down to specific scenes from favorite films, court transcripts as conversations, and Dylan's own writings as narrative strands. Access is crucial to I'm Not There's success, and the filmmaker wisely took his information and tweaked it to protect the source. That's why some of the scenes seem so surreal, and why the commentary's details are so delightful. They make moments of overreaching obvious, the most oblique and unsubstantiated stumble appear as the most purposeful aspect of the production. There are dozens of reasons to love this film - the amazing music, the stellar work of the entire cast, Haynes attention to detail (both from a real and a 'reel' life viewpoint), the decision to make Dylan into what he represents, not so much what he is..on and on and on. In the decades that follow, I'm Not There will earn a spot in film's hierarchy of heroes. It's a great film, and DVD is the only way to experience it fully. Combining beautiful black and white as well as vibrant color footage, the transfer of I'm Not There from the Weinstein Group and Genius Products is excellent. The contrasts are clean and the details definitive. The 1.85:1 anamorphic widescreen image is remarkable. While Haynes was hobbled by a limited budget, his vision was clearly infinite. This movie looks remarkable. Presented in a cracking Dolby Digital 5.1 mix, the soundtrack to I'm Not There matches the visuals in technical vibrancy. From the creak of an old locomotive to the sounds of an angry concert audience, Haynes allows the channels to create an atmosphere that's both immersive and inviting. The various Dylan originals and covers that make up the score are treated with dignity and respect, and the dialogue is easily discernible and clear. Overall, the initial tech specs here are great. And as mentioned before, the plentiful bonus features are the sticky sweet icing on this creative cake. Aside from Haynes' commentary, Disc 1 of the two disc set contains an onscreen lyric guide, an ability to select specific songs (and their accompanying context) within the film, and a series of text-based essays and overviews that function as an introduction to the director and his approach. The second DVD continues the added content goodness by providing a series of deleted scenes (many of them memorable), a look at some outtakes, a couple of alternative/expanded sequences, and auditions from various members of the cast. We then get another Haynes conversation (this time in the form of a Q&A), a making-of concerning the soundtrack, a look at the red carpet premiere, and a series of trailers and stills. Last but not least, there's a "Dylanography" which offers everything from the films the musician participated in to his books, songs, albums, etc. The entire package becomes a rather comprehensive entertainment encyclopedia, providing context that some may believe the movie missed. It's a near definitive digital presentation. As a companion piece to Martin Scorsese's amazing documentary on Dylan's formative years, No Direction Home, I'm Not There finally places a classic cultural icon in proper perspective - musically, philosophically, personally, professionally, emblematically, and mythologically. And just like that aforementioned triumph, director Todd Haynes' homage earns an equally impressive DVD Talk Collector's Edition rating. The format doesn't get much better than this, a quality representation of an equally important film. Students of cinema will more than likely be studying this aesthetically rich experience, not just for what it represents as an example of the artform, but for how it deconstructs the very genre it's meant to support. Bob Dylan may be a national treasure, or perhaps just someone who stuffed shirts say to celebrate without much meaning to the current mainstream. But as Haynes and I'm Not There show, there is much more to the man that his music. A movie like this proves it over and over again.